Anaheim, CA – Sep 17: First things first, it has got to be said; Microsoft really knows how to put on a show. Think about it. You have 5,000 developers there. So many things can go wrong but nothing did. It was – from a logistical and executional viewpoint – a perfect event. Kudos to Microsoft for pulling this off. I am impressed. Let me paint the picture for you. Los Angeles. High 70s and all sunny, 5,000 geeks arriving from left and right, with about 60% of us coming equipped with one or more Apple products. The iPhone is, to this observer, in nearly everyone’s pocket at this event. Those without iPhones had to make do with Android devices and the assorted BlackBerrys. Very few (actually, I did not see anyone) had a Windows Phone. Needless to say, Microsoft had a crowd in front of them who probably likes Windows on the computer, but has clearly not gone down the Windows road yet on any of their handheld devices. With the handheld market growing like crazy, it is fair to say that Microsoft has got to be asking themselves what to do? 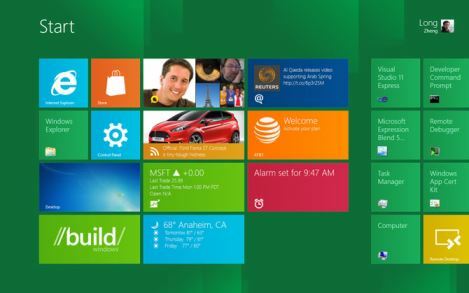 The keynote sessions start off by showing us all the basics of the new Microsoft Windows 8 operating system. The Metro Style dashboard, the apps, and the introduction of Windows RunTime (see my Windows 8 review for a somewhat in-depth explanation of all the terms used above). About an hour into the presentation, their VP of the Windows ECO system tells everyone in the building they will be given a gift; a brand new touch based Samsung slate, with Windows 8 running on it together with a free 3G connection courtesy of AT&T. Also, the agenda for the conference was neatly running in a Metro Style App upon startup. A roar went through the audience, and if only for a minute, everyone of us were Windows 8 freaks, mentally shouting “Go, Windows8 Go!!”. A brilliant move. A marketing coup, if you will. In fact, thinking a bit more about what this means, it seems like Microsoft is focusing on getting Windows out there for all devices again. No more of this “Yes, we too can provide a generic platform á la Java with a virtual runtime”. No sir. Instead we get to see how they have extended COM into becoming something they call Windows Runtime, and sits at the core of Windows, a long with the ever present COM architecture that has been a part of Windows for a long time now. In a sense, this conference had very much of a “back to native Windows” feeling over it, although the representation – in form of Metro Style Apps – is all new. It is not too bad looking at that, I might add. I still have doubts whether or not the broad public will ever want to run Apps on a notebook, but I’ve been wrong before in life so I – like the rest of you – will just have to wait and see what the verdict will be. A couple of final notes on the conference. Notes that we can file under the category called “feelings”. The feeling I got was that Microsoft is at a crossroad. It doesn’t really seem to know which way to go from here. Bing, Windows Phone 7 (and 7.5), Silverlight/WPF. The list can be made quite long on things that have been launched in the past but have yet to make it really big. Now, adding to the above, they launch a very bold and ambitious initiative to capture the tablet/pad/slate market, or – as they claim themselves – to make us start using our notebook and desktop computers with a touch screen. It is not a slam dunk. It’s a beautiful interface but it still doesn’t convince me that this will be what I will prefer to run in my computer at home, and even less so at the office. From an Enterprise Application perspective, the idea of Apps on your computer becomes even more remote, with a possible exception of something like an “Event Notification App”. That said, this was definitely one of those “wish you were here”-conferences. Like I mentioned in the beginning, it was a show for the books.